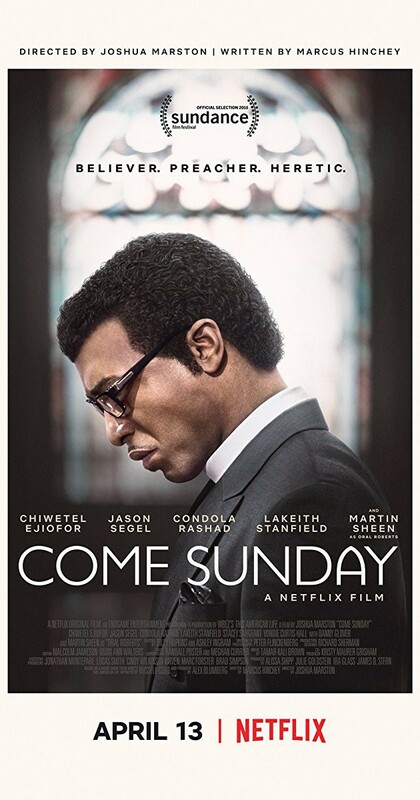 Chiwetel Ejiofor take a stand in the COME SUNDAY trailer! Here's a trailer for COME SUNDAY, a biopic about Bishop Carlton Pearson starring Chiwetel Ejiofor, Condola Rashad, Jason Segal, Danny Glover, and Martin Sheen. It was written by Marcus Hinchey (ALL GOOD THINGS) from an episode of THIS AMERICAN LIFE, and directed by Joshua Marston (MARIA FULL OF GRACE). In COME SUNDAY, Pearson (Chiwetel Ejiofor) is an Evangelist who when he experiences a religious epiphany of universal reconciliation and breaks with most of Protestant faith. In my research and my admittedly limited understanding, universal reconciliation is the idea that the sacrifice of Jesus Christ (if you happen to believe in that sort of thing) means that all humanity's sins are forgiven and Heaven is not reserved for only a select few... and that eternal torment in Hell is not the way of a just God. Martin Sheen plays Pearson's mentor, the televangelist Oral Roberts, who urges him to course-correct against his faith. Danny Glover plays Pearson's incarcerated uncle Quincy. At first glance, I thought the controversy central to this film might be homosexuality being reconciled to Christianity. I was partially-right; Pearson's doctrine opened the door for a lot of people previously deemed unworthy to enter the pearly gates (by both clergy and the parishioners themselves) to receive God's love. Meaning, everyone's welcome to church, now. As you can see in the trailer, the crisis of faith Pearson undergoes rocks his congregation; over half his people leave as Pearson's doctrine broke with their understanding of the Bible's take on Hell. That polarity seems familiar, fourteen years into the future. Given the complexity of the issue, and it's specificity to Christianity, this film will likely be a hard sell to many. Still, it remains an important event in the evolution of American Protestantism. COME SUNDAY will make its Netflix debut on April 13th, 2018.